that her choice would be little more than an act of craven obeisance to the PC crowd, who make it all but impossible for white guys to make it to the Supreme Court these days. Considering that even Democrats have nominated four white guys out of six appointments in the past half century, this is a little rich, but that hasn’t stopped the kvetching. Over at TNR the other day, Jeffery Rosen piled on, pointing out that New York’s senators, “in a burst of demographic enthusiasm,” favored her appointment, and then retailing a long list of complaints from anonymous law clerks about how she wasn’t really very bright and had a bad temper. Just your typical affirmative action hire, in other words. Now, unlike most of Rosen’s critics, I didn’t have a big problem with the fact that most of his sources were anonymous. This is actually one of those cases where it’s probably the only way to write the story, since former law clerks aren’t likely to risk their careers by dishing publicly about their former colleagues, especially ones who might be sitting on the Supreme Court a couple of months from now. I find Kar’s piece utterly convincing. Not every judge attracts this sort of passion from her clerks. And Kar does more than gush: he makes a strongly-argued case that Sotomayor has exactly the sort of intelligence you’d like to see on the Supreme Bench. Better yet, in response to a question, he identifies two pieces of Sotomayor’s legal writing as exemplifying her talents of analysis and legal writing her dissents (thus reflecting her views alone, not aided or burdened by those of her colleagues) in Croll v. Croll and Hankins v. Lyght. I read the Croll case first….I’d give it very high marks; having read first the controlling opinion and then the dissent, I found the dissent compelling. ….Hankyns v. Light involves a bit of law I know something about: the Religious Freedom Restoration Act….My first-blush analysis was to liken a forced retirement to a job-site injury, something that involved secular questions only. But Sotomayor’s argument made it clear to me that clergy hiring (as distinguished from the hiring of a math teacher in a religious school involved in one of the precedent cases) was inextricably a religious matter. 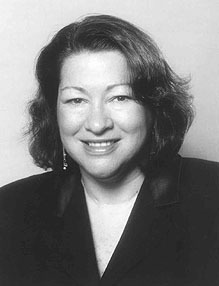 ….So, insofar as a non-expert can judge, Kar’s two examples are both on point: Sotomayor writes much more clearly and persuasively than the average appellate judge. As plenty of people have already pointed out, for a job like Supreme Court justice there’s no such thing as a “best qualified person.” There are, rather, maybe a hundred equally highly qualified people, and it’s silly to pretend that white guys have a hard time getting considered. Just the opposite, in fact, since every time a non-white guy gets nominated, they have to put up with a barrage of innuendo that they’re not really very bright, not the best pick, just a sop to identity politics (unlike the Catholic white guys), and would basically be a taint to the good name of the court. It’s disgraceful.